As one of Britain’s favourite waterfront destinations and Hampshire's second biggest city, Portsmouth has a proud naval and maritime heritage making it a key destination on the South coast. Enjoy one of our many treasure hunts in the area and explore the maze of cobbled streets with clues to the city’s 800 year fascinating history. Home to some of the world’s most famous historic ships, HMS Warrior, the Mary Rose and of course, Lord Nelson’s HMS Victory, Portsmouth is a firm favourite for one of our murder mystery events. Why not have pre dinner drinks in a waterfront location after a day spent in around the vibrant Gunwharf Keys and Spinnaker Tower? For more ideas give our sales team a call on 0845 006 06 06 and discuss your requirements, fill out a quick enquiry or take a look at some of the other great events we run in Portsmouth below! 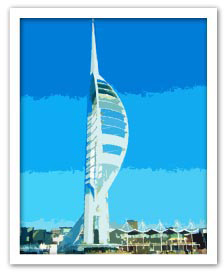 Situated just a short distance from some of Portsmouth’s most popular sights such as the Spinnaker Tower and the Historic Naval Dockyard; Portsmouth Marriott Hotel is ideal for a team building event. The hotel also benefits from 11 meeting rooms with space for up to 350. Standing proudly on the seafront, the Best Western Royal Beach evokes an authentic feeling of bygone days. A beautiful Victorian property, the hotel boasts magnificent chandeliers, grand staircases and seafaring memorabilia as well as 124 bedrooms and four meeting suites.